intro to "Im Januar am Nil"
"Im Januar am Nil" is for chamber orchestra: two soprano saxophones (alternated with clarinet and bassclarinet, drum kit, piano, four violins, two cellos and one doublebass. The saxophones and string instruments are microtuned to allow the orchestra to produce the specific formants, thereby simulating vowel sounds. Barlow used a spiral to inform the structure of his music. If you look at the image below you will see his spiral. 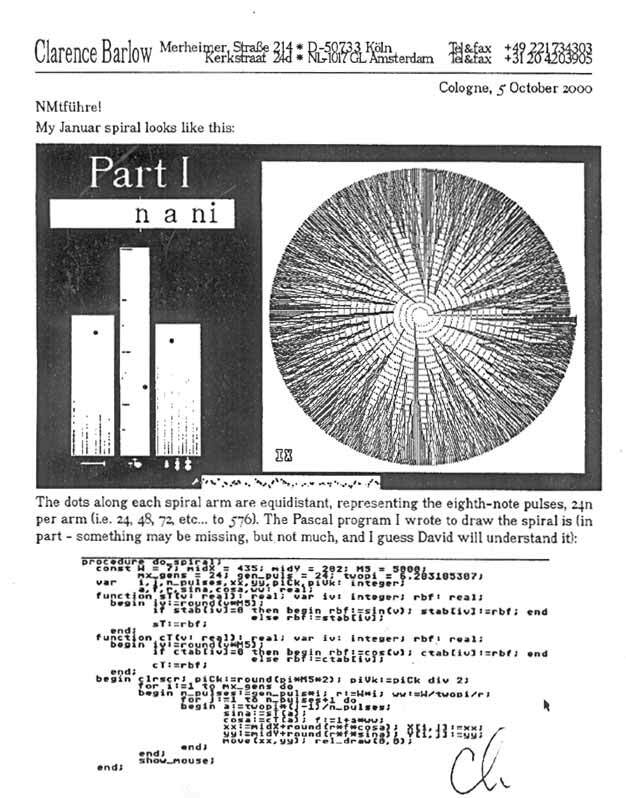 The computer was programed to produce melody to fill time equal to the segments produced from a series of spokes radiating from the center of spiral. The distances between these spokes increases as the path reaches farther out in the spiral.